THE VF1 DIRT BIKE HELMET BY VEGA HELMETS COMBINES SAFETY, A PROVEN DESIGN AND UNCOMPROMISED QUALITY AT AN UNBEATABLE PRICE. 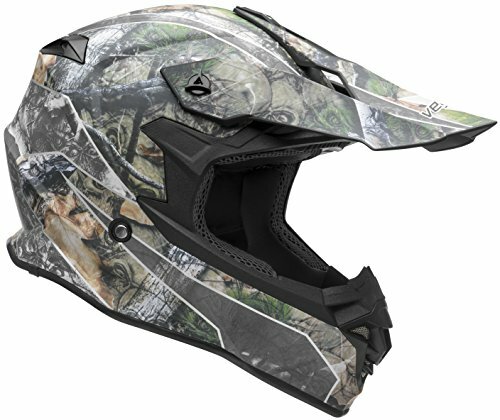 The VF1 Off-Road Helmet by Vega Helmets is the ultimate choice for off road riding with its proven design, reliable coverage, comfortable fit, and incredible value. The VF1’s enhanced styling, multi-channel air flow system, fully removable max-flow liner, thick high density EPS, and lightweight composite construction shell make for a great riding experience with less fatigue. ; Multi-channel air-flow system with fully vented EPS keeps your cool. ; Full face design with large clear-view eye port, side traction plates to keep goggles secure, true to size fit, and even weight distribution. ; Available designs: Matte Black, Stinger Graphic, or the new SKULL CAMO. The VF1 Dirt Bike Helmet is in stock and ready to ship. Get yours today.